NEW YORK/ST. 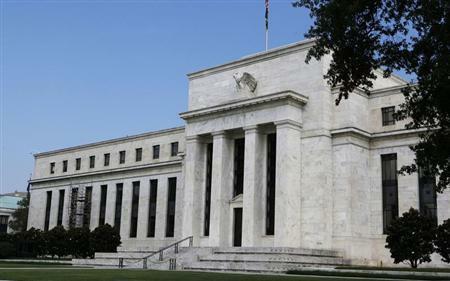 LOUIS (Reuters) - Three Federal Reserve officials on Wednesday said they believe the U.S. economy is gaining traction despite a recent slowdown from severe weather, allowing the central bank to stick to its plan to wind down its massive bond-buying stimulus this year. The comments, from the heads of the Federal Reserve banks of St. Louis, San Francisco and Atlanta, freshen the message in the minutes of the Fed's most recent policymaking meeting, also released Wednesday, which showed many thought only a big change in outlook could disrupt further measured reductions in purchases. Indeed, several Fed policymakers wanted to drive home the idea that their asset-purchase program would be trimmed in predictable, $10-billion, increments, according to minutes of the Fed's January 28-29 policy meeting. The minutes also showed the officials were nearing a decision on how to adjust a promise to keep interest rates low for a while, including the possibility of incorporating financial stability concerns in that promise. At the meeting, which was former chairman Ben Bernanke's last, the Fed decided to make another modest cut to its bond-buying program, which now runs at $65 billion per month. It made the move despite weaker-than-expected job gains in December and turmoil at the time in emerging markets brought on in part by the withdrawal of Fed stimulus. Participants generally "anticipated that the economy would expand at a moderate pace in coming quarters," the minutes said. "Several participants argued that, in the absence of an appreciable change in the economic outlook, there should be a clear presumption in favor of continuing to reduce the pace of purchases by a total of $10 billion at each (policy) meeting." Even those who were more worried about persistently low inflation and high unemployment did not push for a pause to the taper, the minutes showed. A recent run of soft economic data since the meeting, much of it attributed to bad weather, appears to have done little to change that view, at least among Fed officials speaking Wednesday. "I think a lot of this (softness) will come back out as we get into better weather patterns," St. Louis Fed President James Bullard told journalists after a speech at the Exchequer Club in Washington. John Williams, president of the San Francisco Fed, said in New York that the economy has shifted to a "healthy, stronger path" and noted there is a "high hurdle" to stop the U.S. central bank from its plan to keep cutting its bond purchases. Similarly, Dennis Lockhart, president of the Federal Reserve Bank of Atlanta, said the central bank will likely end its bond-buying program by the fourth quarter "as long as the outlook remains solid and does not deviate dramatically from the path we believe it's on." None of the three vote on the Fed's policy-setting panel this year, but all three participate in regular policy discussions. As it stands, the Fed under its new Chair Janet Yellen aims to wind down and halt the bond buying later this year. She will run her first policy-setting meeting March 18-19. The Fed has promised to keep interest rates near zero until well after the U.S. unemployment rate, now at 6.6 percent, falls below 6.5 percent, especially if inflation remains below a 2 percent target. The minutes showed Fed officials expect to alter this guidance soon, given how close the current jobless rate is to the 6.5-percent rate-hike threshold, and the minutes suggested a lack of appetite for simply moving the threshold lower. In what might come as a surprise to some, the officials raised the possibility that financial market risks, such as asset-price bubbles, should play a bigger role in the decision on when to tighten policy. "Several participants suggested that risks to financial stability should appear more explicitly in the list of factors that would guide decisions about the federal funds rate once the unemployment rate threshold is crossed," the minutes said. Bullard said that while no language to that effect had been directly proposed, "we've come off a very difficult financial crisis and we don't want that to occur again." Williams, meanwhile, stressed the Fed should not "oversimplify" its policy plan down to one or two economic indicators. Several officials also argued that any refreshed forward guidance should stress the Fed's "willingness to keep rates low if inflation were to remain persistently below the Committee's 2 percent longer-run objective," the minutes showed. Inflation has recently been running at slightly above 1 percent. As it stands, Wall Street economists expect the Fed to keep rates near zero until around the third quarter of next year, a prediction that aligns with that of the central bank itself. The challenge for the Fed is adjusting its forward guidance without sparking turmoil in bond markets. Beyond halting the bond buying and raising rates, the Fed also plans eventually to shrink its balance sheet down from $4 trillion currently. Williams told reporters it was appropriate for the Fed to update its 2011 "exit strategy" for doing so. "When the world changes, we have changed our plan in an appropriate way," he said, noting that the Fed has made clear that it does not intend to sell any of the assets it has bought until perhaps "later on. According to the minutes of the January meeting, some participants wanted to amend the Fed's statement on longer-run goals and monetary policy strategy to explicitly indicate that inflation running persistently below the 2-percent target is as undesirable as inflation running persistently above it. In the end, however, Fed officials made only minor changes to the statement, with Fed Board Governor Daniel Tarullo abstaining on that point because "he continued to think that the statement had not advanced the cause of communicating or achieving greater consensus in the policy views of the Committee." Only 10 officials voted on Fed policy in January, but a broader group of 17 took part in the meeting. It was the first meeting without a dissent since June 2011, a sign of how tumultuous Bernanke's tenure has been.